Sick today, ugh, so short news post. First, raffle for original art/vet debt is up THIS SUNDAY. The meter keeps climbing upward, and we're almost halfway to the next story being unlocked. All purchases of stories and/or donations count toward the total, and each $5=1 ticket. Winner will be picked by random number generator on Sunday night, 8PM EST. MWF updates are back to normal for February, so the first two weeks of the month, and then WF for the rest of the month. Unless the Patreon reaches the next goal of course! Speaking of, Crystal Robinson, please check your Patreon mail so I can do your porrrtraiiiit. I leave you with a picture of my new birb. I'm not me if I don't have something furry/feathered to love, and these past few weeks have really sucked. 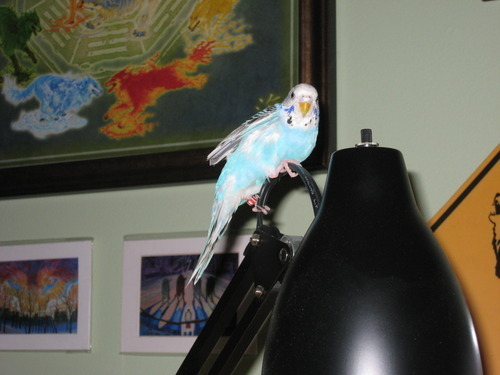 Got a budgie last weekend. Name TBD, but I'm leaning toward Earl Grey/Lady Grey, as soon as it's old enough to tell. Of course, I might well call it Galactobird Lord of All, so I'm not set on any particular theme yet. Lastly, speaking of all things amazing and Australian (synonymous as far as I'm concerned), I got to watching Miss Fisher's Murder Mysteries on netflix. It is made of complete win.